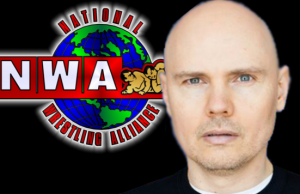 Saturday, August 10, 2013 Kingsport, TN at the Civic Auditorium. 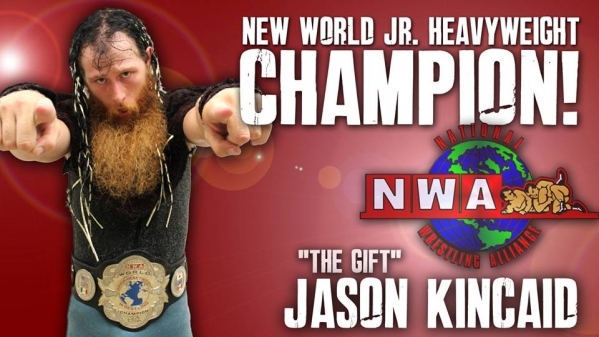 History was made this past Saturday in Kingsport, TN as current NWA Smoky Mountain Champion, Jason “The Gift” Kincaid defeated Chase Owens to become the new NWA World Junior Heavyweight Champion. The two men tangled for over 40 minutes in an instant classic that featured nearly 2 dozen near falls. In the end, Kincaid prevailed with a flipping stunner from the top rope. NWA Worlds Heavyweight Champion, Rob Conway also wrestled on the card, successfully defending his title against the 6’7″, 315 lbs. Chris Richards via Disqualification. 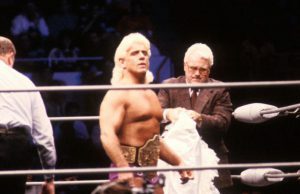 Conway seemingly had the match in his favor, when Richards’ partner, Tony Givens attempted to hit the champion with a pair of brass knux. However, Conway was able to move out of the way, and Givens accidentally hit Richards instead. Conway then disposed of Givens with his finishing move, The Ego Trip. For more information visit www.nwasmokymountain.com and www.nwaringside.com.